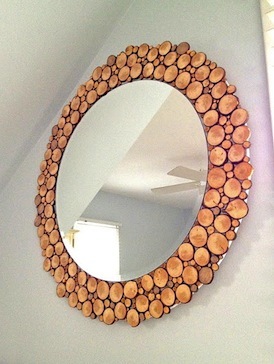 Ashbee Design: Branches • Sliced! 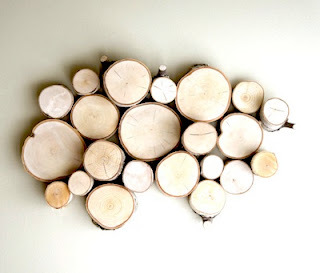 I am continuing with the series about bringing the outdoors in through branches but today looking at the cross-section, that is, branches that have been sliced. The types of projects and applications for this shape can be very different. 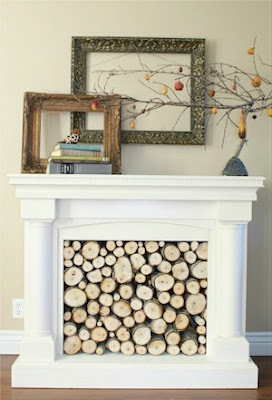 A common one bouncing around the blogs these days is to fill your fireplace with logs, solidly and ends out. 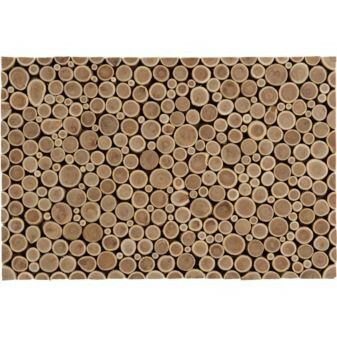 Obviously this is a treatment for non-functioning fireplaces and it does create a wonderful pattern. In fact this treatment has become so popular folks are doing it with other openings as well. It isn't limited to fireplaces. The size of the stick impacts the pattern. 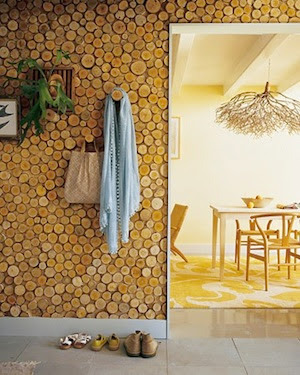 Others take the logs or sticks and slice them even thinner and use them as a wall covering. What I especially like about the treatment below is the random pieces left long to serve as hooks. Brilliant! 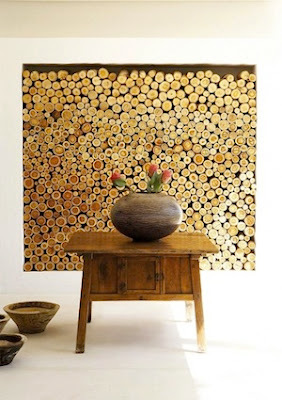 Not sure I'd want a large wall done in this fashion but one wall in the entry would make a great statement. Using sliced logs or branches as a garden path covering is also an option. I do wonder how often they need to be replaced due to rot though. Although visually beautiful I would think it is a maintenance nightmare. 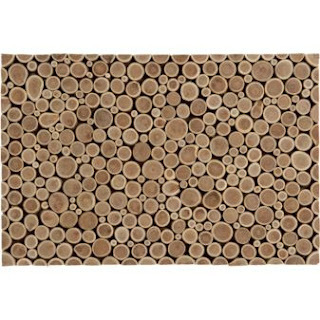 I especially like the floor application and it is available in small scale as a door mat from CB2. 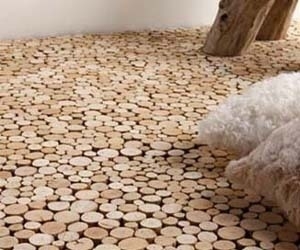 If you like the impact, here are a couple of ideas that definitely could be DIY projects. First, yet another mirror application. (This one could have been in my round post yesterday!) 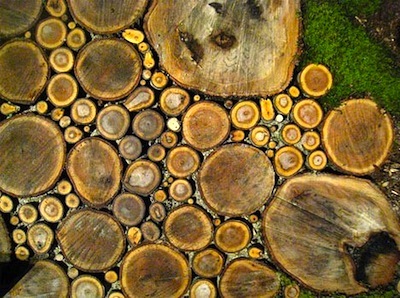 I like the use of multiple diameter slices here. I love this wall collage made of short lengths of birch branches. It combines so many elements of good design all into one. If you make one, it can be totally flexible and fit any space. I see a great project here for me but I think I'll choose a location first.